Turangi is situated in the central North Island on the banks of the world-famous Tongariro River, on its final stretch before it flows into the southern shores of Lake Taupo. Just to the southwest of Turangi is the World Heritage-listed Tongariro National Park. Turangi is close to New Zealand's largest ski-area, the Whakapapa ski field. In the winter season the Turangi/Tongariro area is surrounded by snow-capped mountains. Skiing is the first choice for many visitors, as well as visiting the spectacular volcanoes in the nearby World Heritage-listed Tongariro National Park. A Plus Lodge is situated in a quiet location in the Turangi township area in the Tongariro region. It has large relaxing gardens and is an easy stroll from the shops, banks, bars, restaurants, bus station and information centre. We are a member of BBH World Traveller Accommodation New Zealand. Every day there are thousands of people doing the Tongariro Crossing. Come in or book into the Lodge and during the course of the day you or I will meet people for you to car-share with. Even if you don't have a car you can give a fellow traveller some fuel money and make friends from all round the world and save money for food and lodgings. A few days spent in A Plus Lodge will give you a chance to experience the natural beauty of the Tongariro and Lake Taupo regions, or it's just the perfect hostel to relax and unwind from your travels! 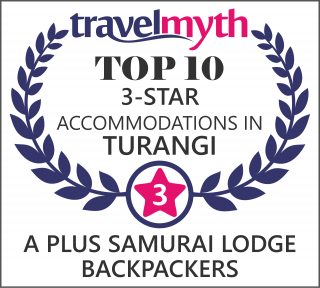 A Plus Lodge is your accommodation in Turangi. The Tongariro crossing car park NOW has a 4 hour restriction. It's best to drive your group to one end, come back and then the driver takes the bus. A Plus Lodge Backpackers is your ideal budget hostel for the Tongariro Alpine Crossing and hiking in the Tongariro National Park in summer, skiing/snowboarding at the Whakapapa ski field in winter and fishing in the Tongariro River or Lake Taupo all year round. As the halfway point between Auckland and Wellington on State Highway 1, we are the ideal spot to take a break at.